What was once cutting edge science fiction aesthetic—as seen in films like Forbidden Planet, Metropolis, Destination Moon, and The Day the Earth Stood Still, or on any Arthur C. Clarke, Robert Heinlein, or Isaac Asimov book cover—has fallen by the wayside in favor of images even more cutting edge. From futuristic grimdark (i.e. cyberpunk) of William Gibson and Blade Runner to fantastical extremes like Star Trek, Jupiter Ascending, or Star Wars, portrayal of the future has splintered over the past few decades. In fact, it’s gone so far that those sleek, shiny space ships and robots of decades ago are fashionable once again—in anything from books like Adam Christopher’s Made to Kill and Allen Steele’s revival of the Captain Future franchise to films like Sky Captain and the World of Tomorrow and Mars Attacks. And video games are not immune. Capturing the retro, modernist aesthetic in playable form, Double Fine’s 2016 Headlander re-invigorates a classic sf motif in neon-colorful fashion. But do we see hints of dystopia around the edges? A side-scrolling, action-puzzle game, Headlander puts the player into the shoes—err, helmet—of a disconnected head lost on a giant space ship. Jet propelled, the head is able to zoom around and connect itself to the various robot bodies wandering the ship, bodies which are in fact augmented humans transformed by the mysterious overlord Methuselah. The player’s head apparently the last unaugmented ‘human’ alive, the player must find their way along the ship’s labyrinthinian corridors, through guarded doors, and fight Methuselah’s security forces, all to reach his hideout and discover the reality of the situation. Minor rpg elements present in the game, the head is also able to dock with various computer systems which give upgrades, e.g. helmet shields, faster recovery, and a variety of other options. 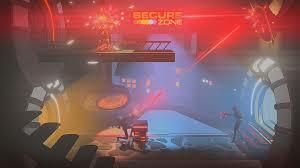 The puzzles often challenging and the action sequences laser hell, the gameplay alternates between twitchy thumbs (avoiding bouncing laser bolts), slow-paced exploration to find the robot bodies and materials necessary to get past security gates. Though Headlander is primarily puzzle-oriented, the fighting mechanics still form a big portion, and are impossible to ignore in order to beat the game. But they are quite simple. Gamers who want a strong action title with a variety of fighting options should look elsewhere. Headlander is a game for gamers looking for puzzles mixed with light action. Classic and (often enough) challenging, the levels/puzzles are wonderfully styled, well-designed, range in size, and are a great example of Metroidvania on the latest generation platforms. The new or innovative element Headlander brings to side-scrolling action-puzzlers is the detachable head and its ability to affix itself to a wide variety of things. Able to connect to computer stations, robots, vacuum cleaners, robo-dogs, and most importantly other people and security guards, the idea forces the player to think laterally: the object/body you are running and gunning with now can be exchanged another in a few seconds as flying the head elsewhere is always a possibility, a necessity even in solving many of the puzzles. Movement within the game is limited by color-coded doors, meaning our friend the head often needs to find the right colored body to take them through, the head alone not enough. Various other triggers and switches needed to be located and pressed in order to progress, Headlander proves the head is still the most important part, the body superfluous. 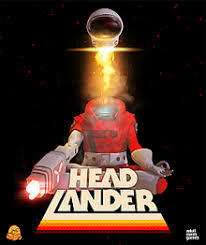 Wonderfully retro-future science fiction in design (the graphics are neon, fun, and vivid), Headlander is a fast-paced, side-scrolling action-puzzle game that does little new (it’s very difficult to do something new with Metroidvania side-scrollers), but what it does, it does with style, urgency, and an attention to detail befitting a fun game (which, after all, is the final measure of any game). It engages the player with quality design, good puzzles, and relatively good action for nearly all of its roughly seven hours of gameplay, and for that is worth the relatively cheap price. 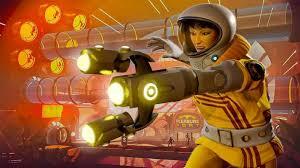 Interestingly enough, where I don’t feel like replaying other big sf games on the PS4, games like Bioshock or Mass Effect: Andromeda (for as much as I enjoyed the latter), I would replay Headlander, which tells me Double Fine have pulled together a nice little package of a game.